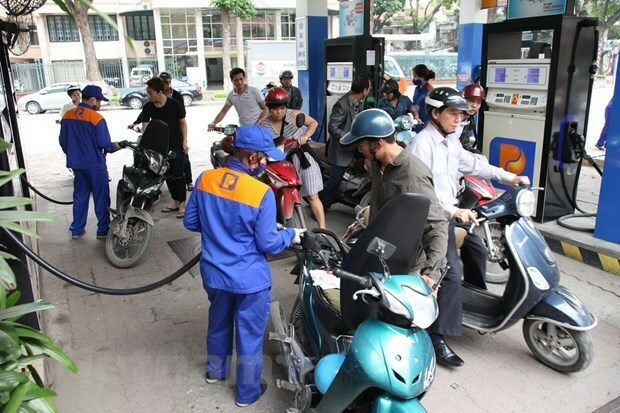 Hanoi (VNA) – The retail prices of oil and petrol went up remarkably in the latest adjustment by the ministries of Finance and Industry and Trade on April 2. The two ministries review fuel prices every 15 days to keep domestic prices up with swings in the global market. Accordingly, the retail price of bio-fuel E5 RON 92 will not be higher than 18,588 VND (0.8 USD) per litre, up 1,377 VND, and that of RON 95 not more than 20,033 VND (0.86 USD), up 1,484 VND. The ceiling prices of diesel and kerosene went up by 1,219 VND and 1,086 VND to 17,087 VND and 15,971 VND per litre, respectively. The price of mazut is capped at 15,210 VND per kilo, up 1,127 VND.